Ever wondered what to do when a big deal starts to feel shaky? Ever worried about how to keep an important client who was being courted by the competition? 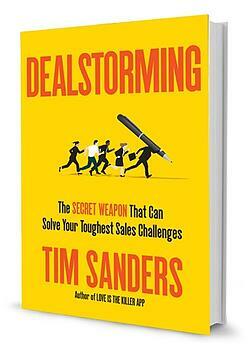 If so, check out my recent interview with Tim Sanders, bestselling author of Love is a Killer App -- and now Dealstorming. This book is all about how to get how to get important deals unstuck. I think you'll learn a lot from our conversation. In Dealstorming, Tim shares some of the freshest sales strategies that I've seen in a long, long time. I get dozens of sales books every year, and this is the one really caught my attention. Listen to the full audio recording or download the pdf of Part 1. Jill: Hello, Sales World. This is Jill Konrath. I am here today with Tim Sanders. Tim, thanks so much for being here today. Tim: Absolutely, Jill. My pleasure. Jill: I would like to get right into this talk about dealstorming, which is the title of your new book and a new term that is not common in the sales lexicon. Can you just define it so people know what we’re talking about? You could be stuck at trying to get a new piece of business or trying to renew an account, but what dealstorming does is combines the freewheeling style of brainstorming with the process style of deal-making. It helps you, as the Account Executive, determine the next best play. Jill: The next best play, so you use it when you’re stuck? That’s the primary use of dealstorming? Tim: Yeah, because in our sales lives, we get stuck a lot. We get stuck on a piece of new business somewhere in the process at the front door when trying to make contact. We get stuck trying to create that win-win deal the customer can’t say no to. We get stuck trying to convince the key decision-maker and the tribe of influencers we can’t even get in front of. In some situations, we get stuck at the contract level, and in every one of those levels of the game, dealstorming will get you unstuck. Tim: Yes. In certain situations, about half of the examples in the book, it’s also about saving accounts, right? Tim: Sometimes, you raise your prices, and you’ve been meaning to raise your prices, and the client leaves you. Sometimes, your account gets poached by a company who’s willing to do it for free or cheap. We’ve learned that dealstorming works just as well to save your most important accounts because the essence of the idea is that when you bring people outside of sales into the process, other departments become your champions inside. If you really believe as an account executive that ideas can come from anywhere, you’d be shocked how obvious the solutions are. Jill: Now, we’re going to get into how dealstorming actually works soon, but I want to hear about the kind of research that you did to come up with this process. You have an extensive background from your basic Yahoo, plus you’ve done consulting work with a number of other organizations and talked to many more. Can you tell us about your background and where all this came from? Tim: The whole thing starts in 1997. I was working for Mark Cuban in Dallas on his start-up, AudioNet. He brought in a new sales VP that worked at Ascend, which was like a company like Cisco, where they did really big, complex deals. So Stan comes in. On the first day, he’s talking to all of us in the “Crows Nest,” which is what we called our break room, and he said, “Every deal matters. I know they’re difficult, but when you get stuck, don’t go down alone.” It just hit me. Jill: What did he mean? Tim: He meant, “Go grab somebody.” His point was no one gets credit for failing on their own in a sales situation. There’s no bravery in that. He goes, “If you get stuck on a deal, then go grab somebody in the broadcast center. Go grab a guy in Finance who could analyze your pricing or your revenue recognition. Partner with marketing. Stop treating them like a service.” He said that, and I was like, “Wow, that’s an interesting idea.” It reminded me a little bit of brainstorming, but at the same time, he was stressing the sales process, right? Tim: You do go down alone, but at the same time, you don’t break the back of the system. That’s where I leaned over to a guy next to me and said, “Cool beans. Dealstorming.” That’s where it started. The first couple of years, it was unstructured. We did well sometimes. Other times, as Stan would say, “It was a goat rodeo. Get people in the room. It wouldn’t work.” I figured that out. By the time I got to Yahoo after the dot-com crash in March of 2000, our SVP in Sales knew that we had a very limited amount of time to do 50 or 100 deals with big names like Nike and P&G because our customer base at Yahoo up until 2000 was just fellow dot-communists like eToys. Tim: That’s when we created the Value Lab, which was a Think Tank that worked with Stanford to study innovation in sales process. We did maybe 50 or 60 different dealstorms in the Yahoo experience between 2000 and 2005. I went and consulted after that, but during the next decade, I did another 60-ish. We did 100 dealstorms collectively, and that gave us one data set, Jill. Then, in writing the book, I interviewed over 200 sales leaders at B2B companies that you might recognize in a lot of categories. What we studied is where they get stuck, how they try to solve the sticking points, what systems they’ve created, what works, what doesn’t work. We put it all into the dealstorming mix, and that’s the book that you now hold. Jill: It’s impressive because you include story after story about how different companies have used the dealstorming process to save accounts or get into accounts where they haven’t been able to get in for a long time. I want to ask if there are any types of accounts that are best for this. Should people be doing this on all their accounts, or is it something that you save for special accounts? If so, what kind? Tim: That’s a really good question. The first step of the dealstorming process is to qualify the opportunity for collaboration. I think of it as a 1 to 10 score, 10 being high and 1 being low. And different companies have different readings, right? For example, I write about Skillsoft, the training company, in the book. They use revenue to determine that score. They’re going to say, “At a certain dollar value, we are going to declare a dealstorm of sorts, and it’s going to have a number of participants that is going to be aligned with the size of the opportunity.” This is very linear, right? Tim: A 9 on their system might have a dozen people in the dealstorm. A 5 on their system might only have the “Fantastic 4,” which might be 2 from sales, 1 from marketing, and 1 from delivery. It varies. The degree of difficulty is the other thing to take into account. Sometimes, Jill, you’ve only got one problem on the deal—you can’t get into the front door. That just escalated, right? In those cases, you’re going to get one person to help you. Or you’re stuck on this specific contractual term, so that’s not high degree of difficulty. In other situations, you’re selling to a committee with the procurement group behind them, and you’re selling a very complex product where they’re doing their own research and there’s mass chaos. For a lot of those listening, you experience this. That’s when you really need cross-departmental collaboration to create those solutions, those devices that cut through the mix and help you level up. Jill: I see that complexity and chaos happening more and more in today’s bigger deals and I think it’s very scary for reps. They don’t know how to do it alone. They’ve never had to manage anything like this, and it’s not necessarily what people were hired to do. Jill: They thought they were hired to sell, and suddenly, they’re here to manage a whole project, and they have competing priorities from groups that are spread around the country or across their office. There are people with different priorities that are trying to make the decision, and it gets very hard to pull them all together. Tim: When I first started selling back in ‘70s—I’ll date myself—I sold radio. You fill the funnel, you made the demos, you get an Insert Order signed, you pick up a check, and it was very simple. I still go to Radio Conferences, I was at one just a few weeks ago, and it’s completely different today. The complexity of how their inventory management system works, and the SalesForce integration, and the way that their customers don’t just buy radio, the buy market penetration, and they buy metrics, et cetera. It can make your head explode how complicated it is now to do a $50,000 deal. Jill: How many people are involved in it too? Again, when you expand the complexity and the special interests of different groups, can you say that it gets even more hard? Tim: Yeah. It’s real interesting too because when you think about how people buy services these days, there’s the good, the bad, and the ugly. The good is that there’s more sophistication. If you have a winning product or a service, you’re more likely to have that recognized, so that’s the good news. The bad is that they’ve teamed up on you and they’re now multi-disciplinary. Meaning, it’s not just the user anymore and the IT chief. It’s everybody. It’s finance. It’s operation. It’s HR. It’s third-party consultants, so they’ve got this cross-disciplinary team beating you down. The ugly, Jill, as we know from our experience as CEB, is they don’t agree with each other, so they’re dysfunctional on top of everything. As a salesperson, you got to innovate your way out of this one on one, as well as solve all of their psychological problems. That’s why I believe you have to build a network to sell to a network. Jill: Exactly. In your dealstorming process, what I like about it is how you pull together the team. You’re not just pulling together the guy who sits next to you. You’re pulling together people from the different disciplines across the organization, all of whom could have some ideas, or insights, or information that could unlock the stuck point and create new options for going forward. How do you decide, from your perspective, who should go on a team? I know you’ve already talked about the number of people on a team being commiserate with the value or the size of the opportunities for your organization, but how do you decide who should contribute? Tim: There are 2 exercises I always advise. The first one is the Stakeholder Map. The best collaboration that happens in a sale situation is when the AE brings in the key stakeholders—people that have a really big stake in how it turns out. They might have to deliver on the deal once it’s done. Or they may be impacted internally either having to do financial arbitrage or it might change the way they develop next year’s marketing. There’s a map you can create that helps you understand who these 3, 4, 5, 6 people are who have a big stake in how it all turns out. That’s important, Jill, because they’re going to come in and get engaged because being involved early helps everyone avoid mistakes that can create a nightmare for them later. Tim: Such as the Revenue Recognition Analyst who sat in Finance who came up with the winning play for an ROI for the software installation that no one had thought of because he understood how his mirror at the prospect did revenue recognition too. Or situations where we’d have Account Coordinators who generally just take orders and deliver—they come in, and there’s information that’s never been put in SalesForce or never been shared at sales conference about how specific accounts have reacted to specific implementations that comes out in these meetings. I find that in so many situations, the AE and the Sales Manager know about 20% of the information that’s really out there in the market. Everybody else who’s delivering knows the rest. You bring them in, and you say, “I want you to join a team.” I’m not asking them to come to a meeting—I’m asking them to join this real team.” You’d be surprised how quickly they will reveal what they know, and that’s the magic of collaboration because for me, even if you don’t come up with the next best play in the meeting, anything that dramatically increases the quality of the AE’s perspective about the whole deal leads them to quickly find a solution. Then, they have to say, “Why is that?” It’s a game called “The 5 Whys.” The outline is in the book, because the more you understand the real problem, the easier it is to invite 1 or 2 experts in that problem space to be the ones in the dealstorm who work with all the stakeholders. Jill: It’s really hard too for salespeople or AEs to sometimes find the real reason. They’re so invested in what they’ve done so far and all the things that they’ve tried to do to move the deal forward that sometimes they have a hard time stepping back and seeing what might be the real root cause of the issues that they’re facing. Tim: That is no way to innovate, right? I think that most of the problems we have to solve to get a deal done are problems on our side. Is there a market issue that’s causing us to be stuck that we haven’t thought of? Is there a people issue on this account that we haven’t thought of? Read the second half of Tim's interview on Thursday or listen to the full audio.